This month we're having an EXTRA SPECIAL board game night as we're featuring Archmage, an amazing board game created by our very own local Tim Heerema, co-owner of the Giddy Goblin game store in Hanover! Enter a magical world as a young mage where you'll explore the land, collect relics and train apprentices to work your way toward becoming the Archmage Wizard. Hosting all of your favourite gaming mechanics like exploration, resource management, map control and of course, spell casting, Archmage is sure to tick every box and become a favourite! Join us to play this epic adventure and support our local game creator! Join us to head back to the birthplace of the game in DOMINARIA. Discover new cards a week early with prerelease events! The first event will be on Saturday, April 21st and then another one on Sunday the 22nd. With your pre-release entry fee you will be supplied with everything you need to compete for that day. For Sealed Deck, you will be given six booster packs to play with, including a special foil pre-release promo card and an additional foil Legendary card. Sealed deck means you must use the contents of your packs to create a 40 card deck(s) you will use to compete with your fellow players for the day. Sealed Deck is a fun and simple format that almost everyone can enjoy; perfect for seasoned grinders or the most casual of players. DOMINARIA booster prizes for the top placing players! The cost to enter is a flat $35.00 per person, taxes included (per event). Deck building begins at 12:00 NOON on each day. See you there! The Golden City of Orazca has been found! Build your forces and stake your claim to Orazca with Ascend cards! Join us to to continue exploring Ixalan a week early with RIVALS OF IXALAN prerelease events! The first event will be on Saturday, January 13th and then another one on Sunday the 14th. With your pre-release entry fee you will be supplied with everything you need to compete for that day. For Sealed Deck, you will be given six booster packs to play with, including a special foil pre-release promo card. Sealed deck means you must use the contents of your packs to create a 40 card deck(s) you will use to compete with your fellow players for the day. Sealed Deck is a fun and simple format that almost everyone can enjoy; perfect for seasoned grinders or the most casual of players. RIVALS OF IXALAN booster prizes for the top placing players! A whole world waits to be discovered. Ancient ruins from the Sun Empire's heyday can now be found, overgrown and half-buried, in the depths of the jungle. Sacred springs infused with magical power well up from high mountainsides. Hidden coves hold pirate treasures stowed by captains long forgotten. Brave explorers from all four peoples uncover such sites as they scour Ixalan in search of the golden city. Join us to see the world of IXALAN a week early with prerelease events! The first event will be on Saturday, September 23rd and then another one on Sunday the 24th. With your pre-release entry fee you will be supplied with everything you need to compete for that day. For Sealed Deck, you will be given six booster packs to play with, including a special foil pre-release promo card. Sealed deck means you must use the contents of your packs to create a 40 card deck(s) you will use to compete with your fellow players for the day. Sealed Deck is a fun and simple format that almost everyone can enjoy; perfect for seasoned grinders or the most casual of players. IXALAN booster prizes for the top placing players! The second sun has settled between the horns on the horizon, and the Gates to the Afterlife open to reveal the promised paradise on the other side. Are you ready to meet the God-Pharaoh? Join us to see HOUR OF DEVASTATION a week early with prerelease events! The first event will be on Saturday, July 8th and then another one on Sunday the 9th. With your pre-release entry fee you will be supplied with everything you need to compete for that day. For Sealed Deck, you will be given six booster packs to play with, including a special foil pre-release promo card. Sealed deck means you must use the contents of your packs to create a 40 card deck(s) you will use to compete with your fellow players for the day. Sealed Deck is a fun and simple format that almost everyone can enjoy; perfect for seasoned grinders or the most casual of players. HOD booster prizes for the top placing players! The Kaladesh Inventors' Fair, a celebration of innovation and ingenuity, was a ruse. Join us in the new year to celebrate the release of Aether Revolt a week early with prerelease events! There is LIMITED SEATING for this event. If you plan on attending one of these events, please hit “going” on your invitation or talk to us at the store. The first event will be on Saturday, January 14th and then another one on Sunday the 15th. With your pre-release entry fee you will be supplied with everything you need to compete for that day. For Sealed Deck, you will be given six booster packs to play with, including a special foil pre-release promo card. Sealed deck means you must use the contents of your packs to create a 40 card deck(s) you will use to compete with your fellow players for the day. Sealed Deck is a fun and simple format that almost everyone can enjoy; perfect for seasoned grinders or the most casual of players. AER booster prizes for the top placing players! There is LIMITED SEATING for this event. If you plan on attending one of these events, please hit “going” on your invitation or talk to us at the store. The first event will be on Saturday, September 24th and then another one on Sunday the 25th. With your pre-release entry fee you will be supplied with everything you need to compete for that day. For Sealed Deck, you will be given six booster packs to play with, including a special foil pre-release promo card. Sealed deck means you must use the contents of your packs to create a 40 card deck(s) you will use to compete with your fellow players for the day. Sealed Deck is a fun and simple format that almost everyone can enjoy; perfect for seasoned grinders or the most casual of players. KLD booster prizes for the top placing players! 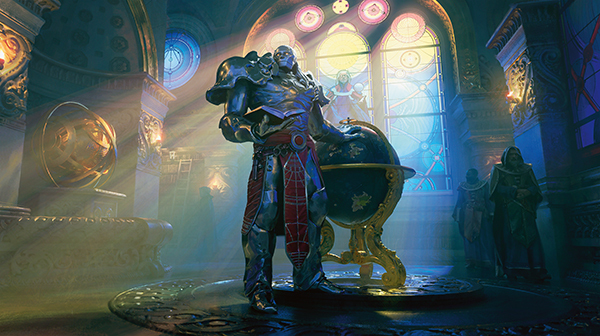 Join us for a day of draft in celebration of the release of Conspiracy: Take the Crown! All day there will be drafts followed by multiplayer matches. The winner of each multiplayer match will receive three boosters as a prize or free entry into the next draft. See you there! The Eldritch Moon Game Day will be Saturday, August 13th start at 12:00 Noon. For this set there will only be one Game Day event instead of the usual two. Game Days are a fancy Standard format tournament in which players compete Swiss round style for 4 or 5 rounds. Every player that comes to the event will get a special full-art promo Unsubstantiate card and each top 8 placing player will get a FOIL full-art Heron's Grace Champion promo! The 1st place champion will also get a limited edition playmat. The entry cost for this Game Day is FREE. Additional prizes (relating to player turnout) will be in the form of store credit and be rewarded to players with an X-1 standing or better. Use cards from Eldritch Moon, Shadows Over Innistrad, Magic Origins, Dragons of Tarkir, Battle for Zendikar and Oath of the Gatewatch to brew up a Standard deck for the event! This year's Fifties 1st Friday will take place on August 5th. During this day there will be a massive Fifties theme throughout the downtown core including fifties dress, an antique car show and more! Scenic City Games will be open late this night and various select merchandise will be discounted! The second and final set in the Shadows Over Innistrad block is soon due... Eldritch Moon! We suspected things were going a little crazy with the growing paranoia in Innistrad but now with the emergence of Emrakul, things have gone 100% Uktabi Orangutan-approved bananas. Bask in the madness with us! If you plan on attending one of these events, please hit “going” on your invitation or talk to me us the store. It never hurts to save a seat! The first event will be on Saturday, JULY 16th and then another one on Sunday the 17th. With your pre-release entry fee you will be supplied with everything you need to compete for that day. For Sealed Deck, you will be given six booster packs to play with (4 Eldrtich Moon, 2 Shadows), including a special foil pre-release promo card. Sealed deck means you must use the contents of your packs to create 40 card deck(s) you will use to compete with your fellow players for the day. Sealed Deck is a fun and simple format that almost everyone can enjoy; perfect for seasoned grinders or the most casual of players. SOI booster prizes for the top placing players! Deck building begins at 12:00 NOON. See you there! This Saturday from 8am to 3pm the whole of downtown will be alive with 2016's installment of The Hottest Street Sale Under the Sun! For one day only we will have all of our in-stock board games discounted by at least 15%. Other discounts are abound inside and outside the store. Come down and enjoy the weather and the deals! In the 1920s, Mr. MacDowell, a gifted astrologist, immediately detected a supernatural being upon entering his new house in Scotland. He gathered eminent mediums of his time for an extraordinary séance, and they have seven hours to contact the ghost and investigate any clues that it can provide to unlock an old mystery. Unable to talk, the amnesic ghost communicates with the mediums through visions, which are represented in the game by illustrated cards. The mediums must decipher the images to help the ghost remember how he was murdered: Who did the crime? Where did it take place? Which weapon caused the death? The more the mediums cooperate and guess well, the easier it is to catch the right culprit. In Mysterium, a reworking of the game system present in Tajemnicze Domostwo, one player takes the role of ghost while everyone else represents a medium. To solve the crime, the ghost must first recall (with the aid of the mediums) all of the suspects present on the night of the murder. A number of suspect, location and murder weapon cards are placed on the table, and the ghost randomly assigns one of each of these in secret to a medium. The $4.00 entry fee will allow for the playing of this title and many others! The PPTQ last November for Pro Tour Madrid was such a success that Scenic City Games will be hosting another PPTQ tournament for pro tour Honolulu 2016! What does this mean? What is a PPTQ? In short, this event is a preliminary step to enter a regional pro tour qualifier at another location later in the year, which a victory would then earn you a spot at the Pro Tour Honolulu in October. Standard constructed. Registration opens at 10:00am, player meeting is at 11:45am and round one will begin at 12:00 Noon. After the Swiss rounds there will be a single elimination top 8 cut. This PPTQ will have a player cap of 32. Pre-registration is recommended for this event. PRIZES: In addition to the winner getting a spot in a future regional PTQ, prizes for the top 8 placers will depend on player turnout and be in the form of tiered in-store credit. 60% of the total entry fees will be used in this way. Deck registration sheets and scrap paper will be available at the store but it never hurts to have all the materials you need and to come prepared. Join us at the end of May for our Board Gaming Night. This month is a celebration of great games made for 2 players! There will be several new and classic titles to try out on this evening; play your favorite or try several! 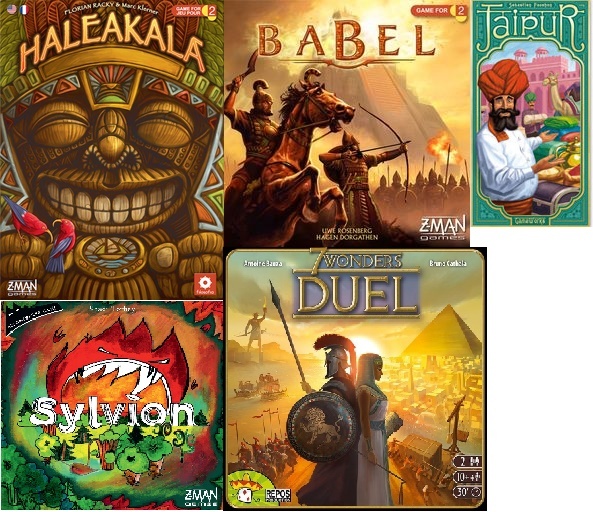 Games include: Patchwork, Haleakala, Babel, Jaipur, 7 Wonders Duel and many more! The Owen Sound & North Grey Union Public Library will once again be host to the Owen Sound Mini Comic Con. There are a slew of events and activities to be had on this day at the Library including Dutch Blitz competitions hosted by Scenic City Games! A family favorite for years, this game has enough scope to be lighthearted fun or a brutal race to the top; whatever you want it to be! Dutch Blitz is a fast paced competitive set matching game for two or more players. If you are unfamiliar with it, check out the video below or just play some of the other games available during the day. BoOST (Business and Organizations of Owen Sound Together) is once again organizing another event: FRESH 1st Friday on May 6. Scenic City Games and several other business in the downtown area will be celebrating in a variety of ways! Hop into Spring with both feet and take a chance on winning a FREE copy of the new Carcassonne: Over Hill and Dale. The store will be open late on this day with sales and discounts throughout the store. Make sure to drop your name in the box to possibly win a free copy of this great Spring game! Carcassonne: Over Hill and Dale, a standalone game in the Carcassonne series, allows players to be farmers who care for animals on their large farms and cultivate the fruits and vegetables in their fields. Take in the magnificent scenery of this vast countryside by hiking a trail surrounded by fruit trees, wheat fields, and sunflowers! You won't be able to resist the juicy apples and sweet strawberries you'll find along the way. This rustic new variant of Carcassonne is alive with interesting decisions and intriguing tactics. Gathering a fine harvest, traveling far and wide, and taking good care of your animals is reward enough, but it might just win you the game, too! Shadows Over Innistrad also has Game Day events! The SOI Game Days will be Saturday, April 30th and Sunday, May 1st both of which start at 12:00 Noon. Game Days are a fancy Standard format tournament in which players compete Swiss round style for 4 or 5 rounds. Every player that comes to the event will get a special full-art promo Incorrigible Youths card and each top 8 placing player will get a FOIL full-art Anguished Unmaking promo - on both days! The 1st place champion will also get a limited edition playmat. The entry fee is $8.00, 80% of which goes toward store credit prizes that are split based on X-0 and X-1 standings. Use cards from Shadows Over Innistrad, Magic Origins, Dragons of Tarkir, Battle for Zendikar and Oath of the Gatewatch to brew up a Standard deck for the event! April's Monthly Board Game meet! This game night is a little different in that it will fall on a THURSDAY instead of the usual Monday. Other than that it's the same as usual: Show up at 6:00pm with $4.00 and play this month's feature title as well as many other of your favorite games. The "Stone Age" times were hard indeed. In their roles as hunters, collectors, farmers, and tool makers, our ancestors worked with their legs and backs straining against wooden plows in the stony earth. Of course, progress did not stop with the wooden plow. People always searched for better tools and more productive plants to make their work more effective.